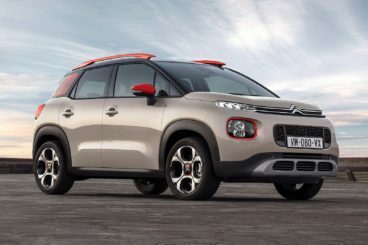 The new Citroen C3 Aircross Hatchback is a funky-looking, chunky family car that extends the comfortable and stylish package of the Cactus to something bigger. For the most part, it largely works, too. That said, it’s well worth bearing in mind that this is Citroen’s first ever SUV. Has it got what it takes to oust the competition? Citroen have been making cars since the end of the First World War and their name lit up the Eiffel Tower for ten years over the 1920s and 1930s. Find out more about this iconic French brand in our brief history of Citroen. OSV takes a closer look at what it’s all about with our 2018 Citroen C3 Aircross Hatchback review. The Aircross is something of a neat and tidy handler, and it feels nice and composed for the most part. It’s armed with plenty of grip, and it’s even fairly agile. Indeed, it’s a much better car to drive than the standard C3, although keener drivers need not get their hopes up – the Aircross isn’t very exciting. In corners, it rolls about a bit, but it never feels out of control. The steering is well-weighted and direct enough to ensure that you can point the car where you want it to be with ease, but the nose does drift wide if you’re moving at pace. A tight turning circle means the car is easy to live within the towns and cities, while Citroen have also thrown in the likes of a bird’s eye view camera, a rear-view camera, and those all-important parking sensors. On the flip side, the rear windows limit visibility somewhat. Another minor gripe is that the steering lacks feedback, and this is a bit of a shame because the car is actually pretty capable off-road. If you are planning to take the car onto muddier terrain now and then, it’s well worth adding the likes of Hill Descent Assist and Grip Control. In terms of its engines, there’s just one petrol available but you can choose from three different power outputs. The entry-level model will be overlooked by most buyers; not only does it do without turbochargers, it also develops just 82bhp. A 0-62 time of 15.9 seconds is also a bit underwhelming. Next up is a 110bhp variant that benefits from turbochargers. It has a 0-62 time of 11.3 seconds, performs well in the towns and cities and out in the country, and it’s our top pick. Should you need a bit more oomph, however, you’ll want to take a closer inspection at the 130bhp variant. It’s refined and bursting with character and has a 0-62 time of 10.4 seconds. The cabin is a pleasant place to spend your time on the road. The design is quirky at times but neat, and the interior is very well organised. 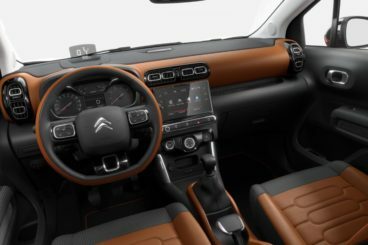 Moreover, despite not being a premium product, Citroen have splashed the cash on a number of materials to give the cabin a touch of class. On the other hand, you won’t have to look too far and hard to find evidence of harder, cheaper plastics, too. The flexible driver’s seat provides lots of adjustability so that you can easily find the perfect driving position, while the steering wheel adjusts for reach. All good so far, but it’s such a shame that the entry-level model has to miss out on physical air conditioning controls. Instead, you need to operate the niggling seven-inch touchscreen when you want to cool yourself down. This won’t be easy, as the screen often doesn’t respond to your inputs – it’s perhaps the biggest disappointment of the cabin. Still, the car is comfortable for the most part, even if ride quality could – and probably should – be better. Insulation, meanwhile, is acceptable. Is the Citroen C3 Aircross Hatchback practical? Taller adults will struggle with the limited headroom on offer, and when the panoramic sunroof is fitted, this becomes a very real problem. On the whole, however, it’s a car that accommodates families well. Roof rails are standard, the loading space is pleasingly versatile, and the boot measures a respectable 410-litres. To increase it to 520, you just need to slide the rear seats forward, and to increase it to 1,289-litres, you just need to fold the rear seats. Can you rely on a Citroen? Read our unbiased and honest assessment of the French manufacturer to find out more. One of the most attractive things about this car is its affordability. However, this means that standard kit is a bit spartan at times. The entry-level model misses out on alloys and – as mentioned – physical air conditioning buttons, but it does come with air conditioning, Bluetooth and automatic headlights. The Feel model also misses out on physical aircon buttons but adds alloys, LED daytime running lights, a seven-inch display, and a body styling kit. The Flair model nets you diamond-cut alloys, a contrasting roof colour, the brand’s navigation software, twin-zone air conditioning, keyless entry, and rear parking sensors. Safety-wise, the Aircross enjoys a 5-star safety rating. Included among its standard safety kit are lane departure warning, blind spot monitoring and traffic sign recognition. Prices for the new car start at £14,350 and rise to £19,325. For more information on our leasing deals, you can check out our page here. In terms of its running costs, the 109bhp variant of the 1.2-litre petrol engine is actually more frugal than the smaller 81bhp variant. This is because it comes with stop-start tech and can return 56.5mpg economy on a good day. The 81hp variant, meanwhile, can manage 55.4mpg at best. Both engines emit 122g/km of CO2 and have a BiK rating of 22%. Citroen have kept up their fine tradition of crafting cars that look anything but ordinary. It’s not the biggest car in the world but – limited headroom aside – this is a very usable hatchback. It’s a neat and tidy handler that’s easy to live with. Adding the panoramic sunroof will make this even worse. The jury is out as to whether the petrol engine in its smaller guises will be strong enough for this car. Let’s see how the car fares against its rivals in the comparison section of our 2018 Citroen C3 Aircross Hatchback review. The new Peugeot 2008 is spacious, economical, and it also boasts a high-quality interior. It might not be as distinct as the Citroen, but it’s still very stylish. It’s a bit of a shame that there’s no four-wheel-drive option. This is a hefty car that can clearly cope with life off the road, and to that end, Peugeot have added Grip Control. This is a system that limits wheel spin in poor conditions, and it gives the car some off-road credentials. A small steering wheel ensures the car is easy to drive in the towns and winding roads, but it’s less handy on the motorway. Out there, it won’t be too long before the steering starts to twitch. In terms of its engines, a solitary 1.6-litre diesel is available with 3 different power outputs. The smallest develops just 74 and will be overlooked by most buyers. We like the 98bhp variant that can get you from rest to 62mph in 11.3 seconds, and it works well on the motorway. However, it’s only the 118bhp variant that comes with a 6-speed transmission. It’s got lots of pulling power in reserve and can complete the 0-62 dash in 9.6 seconds. Running costs? The 98bhp diesel is able to match the entry-level variant for economy, and both can return as much as 76.3mpg on a good day. The 118bhp is a bit more expensive to run, but that shouldn’t count against it too much. Inside, the 2008 is more business-like and conservative than the Citroen, but this is still a classy cabin. It’s smartly designed, comfortable, and the highest spec models are very swanky indeed. Its raised suspension, meanwhile, ensures that it rides better than the Aircross, while its dashboard comprises lots of soft materials and looks excellent. 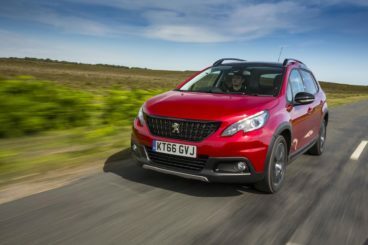 Is the Peugeot 2008 practical? It’s a super roomy car, but the funny thing is that it isn’t much bigger than the Citroen Cactus. It’s tall and long, though, and headroom is better in here than it is in the Aircross. Storage solutions are a bit sparse, however, and the glovebox is far too small. The boot, meanwhile, measures a reasonable 410-litres and can be extended to 1,400-litres by folding the rear seats. The new SEAT Arona is another stylish car in this sector that’s entertaining to drive. Indeed, it’s a bit more entertaining than the Aircross, but it’s not quite as fun as, say, the SEAT Ibiza. That’s hardly surprising as this is a bigger model, but it does manage to feel agile and very car-like. It’s no match for the Citroen off-road, though, and comes without any systems like Grip Control. Instead, tarmac is the Arona’s natural habitat. In urban settings it excels, thanks to well-weighted and accurate steering. That said, its steering also lacks feel and the car does run wide if you take corners with too much vigour. In terms of its engines, there’s just the one diesel available. This is a 1.6-litre unit that’s available with either 94 or 113bhp. Only the former can be paired up with a DSG automatic transmission, but we prefer the latter – it’s bigger and that extra power will prove useful. Running costs? The 94bhp variant is good for returns of 65.6mpg on a good day, while emissions are pegged at 114g/km of CO2. The larger 113bhp variant of the same engine can manage 64.2mpg economy at best, and has a BiK rating of 28%. Inside, the Arona impresses us with its modern design and well-built cabin, but it lacks the premium materials that the Aircross has. Ride quality is acceptable, but if you specify wider tyres, insulation becomes a bit of a problem. The dashboard is similar to the one in the Ibiza, which means it’s high in quality and neatly organised. Overall, though, this cabin lacks the Citroen’s sense of fun – although it is easy to live with. 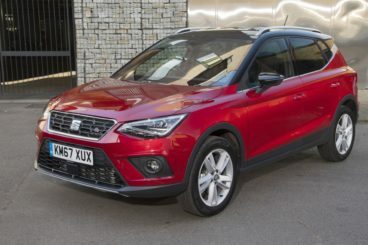 Is the SEAT Arona practical? It’s roomier than a supermini and it’s relatively versatile. Headroom is decent and marginally better than the Aircross, but four adults are going to be a lot more comfortable in here than five. Rear legroom, in particular, is poor. The boot, meanwhile, measures 400-litres. According to official figures, when you fold the rear seats the boots total capacity is 823-litres. This is the first time Citroen have produced a compact SUV, so there are always going to be questions around it. We feel that Citroen have answered most of them well. While the Citroen C3 Aircross Hatchback has one or two flaws, it scores home runs on tech, looks, usability and affordability.